One of the most frustrating and annoying questions that you have to deal with on a regular basis in the Network Marketing industry is the “pyramid” question. 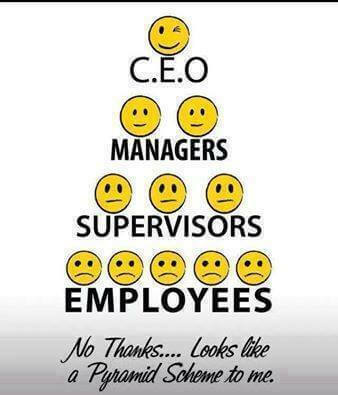 Of course it is a pyramid, so is your job, the government, the girl scouts and the church. However, there are some serious differences. Even though a common perception is that somehow the Network Marketing approach is somehow unethical… but that couldn’t be further from the truth. Let’s analyze the two pyramids. Assume first that the company is relatively stable and that it is not growing drastically or downsizing. How do you climb the pyramid? You get promoted right? Is there an unlimited number of positions available to be promoted to? Usually not, there is one at a time. How do these positions become available? Someone gets fired, promoted or they quit. So now that a position is open, how do you get it? You have to compete against everyone else at your level for it. Since there is only one position available, then someone will win and most will lose. What kind of environment does this create? It creates a very hostile environment! The corporate pyramid creates an environment of lack and hostility. This is likely the number one reason why people say that you have to climb to success on the backs of others. Also, note that someone else makes the decision on whether you get the promotion. Therefore, you need to play the politics as well as perform. How do you climb the pyramid? You recruit promoters, gather more customers, and increase your sales. Are there a limited number of positions available? No. You produce, you get paid. Who chooses who gets the promotion? You do! No one can stop you from working your way up the pyramid. There are no politics and no limitations. It doesn’t matter how much education you have, what your background is, who your family is or how old you are. 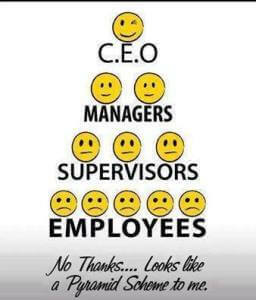 When you get promoted up the pyramid does it hurt someone else? Absolutely not, in fact, when you get promoted it actually helps someone else… So when you win, someone else wins too. It is in the best interest of those who are coaching you to help you get up the pyramid. This creates an environment is of abundance and support. We want other people to win because we all win at the same time. The Network Marketing pyramid creates an environment of abundance, support and encouragement. Of course, there are bad apples in every bunch. However, there is an underlying environment created by each of these approaches which guides the behavior of the whole. I would much rather be in a positive environment than a negative one.